Neil Critchley admits Bobby Adekanye is still feeling the effects of the ankle injury that has seen him sidelined since the beginning of October. 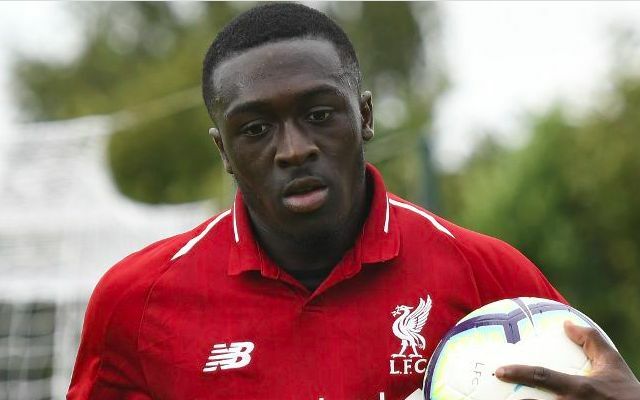 The winger was forced off during Liverpool U19s’ UEFA Youth League clash with Napoli and later deemed to have evaded serious damage. Adekanye, who scored the Reds’ goal in the 1-1 draw, was seen leaving the stadium on crutches shortly after the final whistle. Further assessments have since eased the club’s initial concerns, although it remains unclear when he will be fit to return to action. Adekanye appears a doubt to feature for the U23s as they continue their Premier League 2 campaign at home to Derby County on Sunday. “Bobby is touch and go at the moment,” Critchley told the Liverpool Echo’s James Pearce. Adekanye’s latest setback followed on from a worrying moment late in September, when he required oxygen whilst being stretchered off with a knee injury during the 4-0 defeat to Arsenal. Fears of a lengthy spell out of action were swiftly diminished as he returned the next week to play in the 3-1 win over Chelsea. Niggling fitness issues have proven a frustrating theme to his time on Merseyside so far, often denying him the opportunity to build on flashes of his potential. With a number of familiar youth stars having departed on loan in search of first-team football, Adekanye has been tipped to establish himself as a key attacking figure under Critchley this season. Watching a number of Academy prospects train with the senior team during the international break will have only spurred the former Barcelona man on to get himself back amongst the goals upon his return.